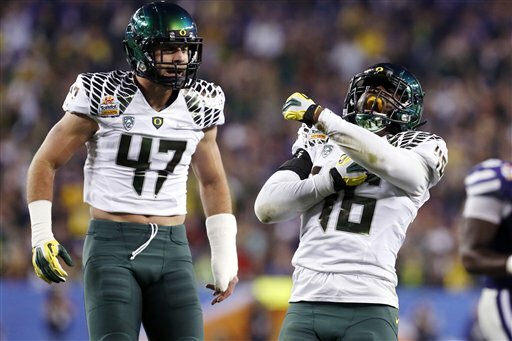 Could Oregon Football Become LINEBACKER U? The hiatus between spring practice and fall football camp allows us time to ponder possibilities regarding our defense, specifically the LBs, who are vital to stopping our opponents. Creating turnovers and getting off the field are crucial for a double-digit win season in 2018. We get that! Do we have the talent, coaching, athletes or recruits coming in to fulfill these lofty expectations? Is there a realistic potential of Oregon joining the ranks of Penn St, Alabama, Ohio St and U$C as a premier linebacker destination? Is “Linebacker U” a tradition we can become, or is it a pipe dream? 1. SIZE matters: 6’0-6’4 and 225-250 lbs. are optimal sizes (smurfs are not OK). Bigger is truly better at LB. 2. SPEED kills: A 4.4-4.8 forty speed is essential for LBs playing both the run and pass. Covering the whole field is a must at this position. Speed like this also makes coaching way easier! 3. SMARTS & INSTINCTS: Read and react, stay home or attack — LBs must know the difference. 4. STRENGTH: Weight room animals can shed blockers, crush running backs in gaps and sack the QB. Opposing offenses must know that “in your grasp they are going to ground.” In other words, LBs who can go full Beast Mode (see top photo for example). 5. SKILLED from head to toe: Brain (reaction time); Eyes (reading keys); Hands (fast); Feet (quick); Body (low center of gravity); Shoulders (square); Heart/Lungs (cardio and courage); Hips (positioning); and Knees flexed. 6. STUDY: So they can understand opposing offenses. LBs must read the QB, know the play angles, know their defensive sets and know where each individual defender should be on each play. A lot of this is accomplished by studying film. 7. SERIOUSLY Relentless: LBs must be aggressive, blow up plays, intimidate opposing players and make the offense play away from them. “Woofing” at times is appropriate, too! 8. SAVVY: LBs are the leaders on the defense. They must be great communicators, technicians, continuous students and extremely coach-able. Dave Wilcox, No. 64: A two-way player in college and an All-Pro, Hall of Fame stud for the ‘Niners. Thomas Graham, No. 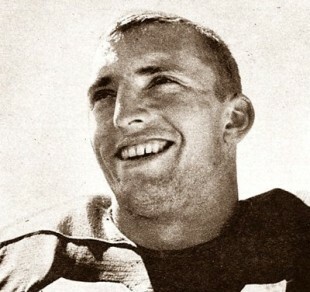 52: A three-year starter and tackling machine who played pro ball with Denver. Ernest Jones, No. 40: A tackling, blitzing machine with speed on the edge. Peter Sirmon, No. 44: A great middle ‘backer from 96-99. He played for the Tennessee Titans for years. Jeremy Asher, No. 44 and Rich Ruhl, No. 48: Inside LBs during the Ducks’ ’95 Rose Bowl run. Casey Mathews, No. 55 and Spencer Paysinger, No. 35: Wreaked havoc for the Ducks during the 2010 Rose Bowl season. Kiko Alonzo, No. 47 and Michael Clay, No. 46: They were tackling demons in the 2012 Rose Bowl win over the Badgers, and they demolished the Wildcats in the Fiesta Bowl the next year. Derek Malone, No. 22, Dewitt Stuckey, No. 53 and Tyson Coleman, No. 33: These three disrupted offenses in Pac-12 during the Ducks’ last Championship run and Natty appearance. ILB Troy Dye No. 35, Jr.: A converted HS safety and our main man in the middle. He has all the ingredients, though he’s working on skills no. 4 and 6 (above), and is developing no. 8. ILB Kaulana Apelu No. 39, Sr: A Former walk-on who’s missing skills 1, 2 and 4. But he’s a play-maker who possesses all the other essentials. ILB Issac Slade-Matautia No. 43, RS Fr. : He’s without skill no. 1, and he’s working on skills 2-8. More game experience is required. 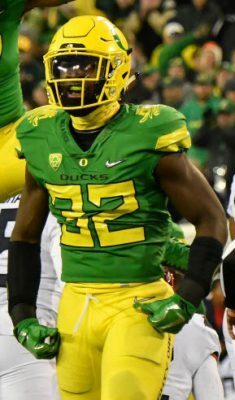 La’Mar Winston has the potential to be the next great UO linebacker. ILB Samson Nui No. 12, So. : He needs time to develop skills no. 3-8. ILB Nate Heuakalani No. 46, Jr.: He’s a bit of an unknown entity to date. OLB Justin Hollins No. 11, Sr.: He has all of the essential skills, though he’s refining 4, 6 and 8. OLB La’Mar Winston No. 32, Jr.: 2018 could be a potential b/o season. He’s working on skills no. 3, 6 and 8. OLB Keith Simms No. 24, RS So. : He’s developing skills no. 4, 6, 7, and 8 and could be impact player in time. OLB Bryson Young No. 56, Jr.: He’s working on skills no. 3, 6, and 8 and has the necessary ingredients to succeed. OLB Matt Christman No. 53, Jr.: Limited reps to date. OLB D.J. Johnson, So. : He oozes talent and potential, but will he contribute this year or next? New LB recruits: Adrian Jackson, M.J Cunningham and Andrew Johnson. Are they all hype or will they reach the height of stardom at UO? Looking back at the past and evaluating the present, I wonder, are the LBs there yet? Who will teach and lead these players to individual and collective team success ? We have an excellent defensive coordinator in Jim Leavitt, and his instruction and guidance should help develop the inside ‘backers. Coach Cort Dennison will surprise some. His skill set will enhance, motivate and burnish the abilities of our outside linebackers to high performance levels. The creative and intelligent orchestration of our D-line with Joe Salave’a, and the back-end coaches Keith Hayward and Donte Williams could create a defense of consummate beauty and mash-ability! However, this is all talk and useless blather unless the wins follow. Accolades will be given if the team gets 8, 9, 10 or more wins this season. Anything else is smoke, mirrors, unfulfilled hype and bitter disappointment. All the tools are in the box. What will we build with these implements? Oregon linebackers Kiko Alonso (No. 47) and Michael Clay. (No. 46). Could we say that, while the Ducks have had good linebacker play over the decades, we are not an elite linebacker school? Probably. The days of boat racing opponents is over, as all college teams have improved their speed, tackling in space and up-tempo play the last decade. That ship has sailed! 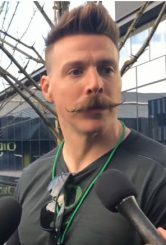 Without throwing shade on any past coaches, the current development of LBs at Oregon will be different with Mario Cristobal‘s staff. A change in philosophy is occurring in Eugene. Dominating the line of scrimmage on both sides of the ball will be the new norm. Bigger, stronger and, yes, faster linebacker play is in our future. Which begs the original question? 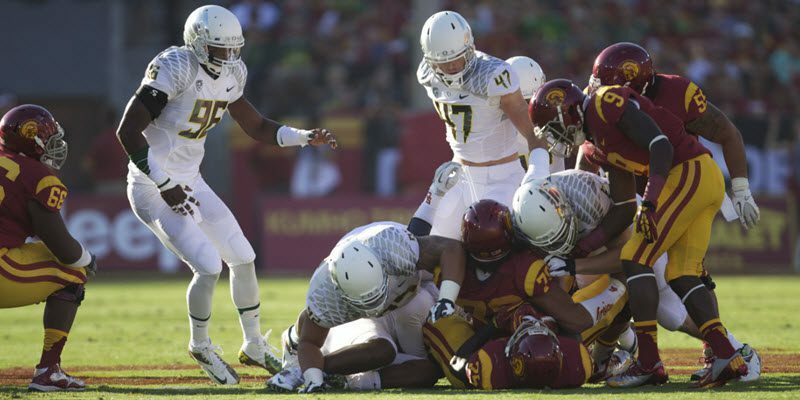 Can Oregon football become Linebacker U? With time, talent and teaching, a resounding yes is my vote. This should be brutally fun to watch!